Rate this Article They say that a need for something is the mother of creativity and invention. Such is the case of wireless technology. It was created for many reasons and it is now coming to VR. One of the wonders of technological development was the ability to send information over long distances. Starting from the creation of the Photophone by Alexander Graham Bell and Charles Sumner Tainter in 1880 which sent audio signals through the variation of light beams, the eventual development of data transmission and reception with the use of Radio Frequency signals has continually inspired the advancement of technology in the fields of radio communications and remote control. The invention of the Photophone happened a long time ago but in today’s present environment, despite the application of WiFi technology in almost anything electronic, the need to do away with wires and cables to transmit information whether as a mild irritant or a grave hazard in some instances has made wireless technology a preference if not a priority. The development of VR is no exception. The current best VR devices (the one's with the highest quality) are still marketed in it's tethered cabled version. Of course this are the HMDs, and both the Vive and the Oculus come immediately to mind. VR technology is still very much in the beginning stages and the upgrades and developments have to naturally come in steps. Implementing the wireless feature onto the devices will naturally provide the immense benefits that wireless has given to other lesser technologies as well. In VR however, though distance may be a reason to be addressed, the current main reasons for implementing wireless on a VR headset would be safety and the need for space to move around. Unfortunately, you cannot really have this if there is a long cable connecting the headset you wear with the PC at the corner. What more, VR ideally cuts you off completely from your present surroundings. A chair, a table or anything in the room might prove to be an invitation to disaster and harm, a long cable can be tripped on or get entangled in a manner that would bring the user down crashing to the floor. There was an incident that happened in Moscow where a man in his 40's lost his life because of VR. Apparently, he was playing StarWars with his headset and was probably swinging his light saber against an AI opponent. He ended up tripping on the cable and crashing into a coffee table breaking the glass on himself. Despite bleeding all over, he kept on playing until his Mother noticed him and called for an ambulance. He must have finished his game that by the time they got him to the hospital he had already bled himself to death and as gruesome as it sounds, it was game over for him. A classic case of Death by VR in the USSR. This is a true story and things like this must not and should not happen just because someone was so addicted to gaming. But they do happen. VR is so immersive that so many users get into accidents because of this. From falling down the stairs to punching the wall, being cut-off from ones surroundings while flailing around is usually dangerous, and that's only in games. VR is already being applied to serious practical uses as well like in the field of medicine and education. They use it to treat military veterans suffering from fatigue and combat psychological disorders to Doctors simulating patient cases prior to actual procedural treatment. VR reaches all the way to Engineering, Arts and Sciences, Communications and even Politics. The applications are endless and being tethered to a computer is a big hindrance to all. In lieu of this, both Oculus and HTC Vive have begun undertaking steps on making the VR experience a wireless, cordless one. 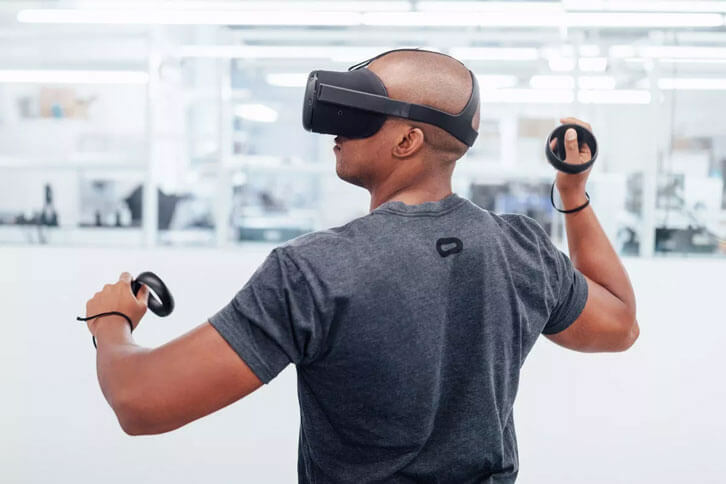 Oculus has already announced and demonstrated to some extent the Oculus Sta. Cruz project which is an all-in-one integrated HMD where the computing electronics will be located on the faceplate and the HMD will have built in cameras and LED sensors that will work together to determine the user's head movement and other motion and spatial information. The HMD will come with it's equivalent touch controllers. HTC and Valve are pairing the Vive Pro with a wireless adapter that will eliminate the tether to the PC. The set-up is practically the same to the current Vive environment sans the tether which is a very big improvement, especially for gamers. The Vive Pro has a 78% increase in resolution and added built in headphones that provide high-quality 3D spatial audio. User's who have tested the demo version have remarked that the freedom experienced from not having to deal with the tether getting in the way was more then enough to convince them that wireless VR is the only way to go. Of course wireless has always been the case with mobile VR where you just inserted your smartphone into the HMD and you where clear to go. However, until mobile VR can catch up to or maybe equal the quality of experience one can only currently get from high end VR, making both the Oculus and Vive wireless would be the priority for an as- close-as- real VR experience one can get. Even with the issue of extending battery life as another priority, as long as the developers work on it, VR technology will then get to the point where all you need will be the HMD that can connect in itself to the internet or a cloud network service where one can view 360° videos and movies or play VR games wherever it's safe for the user to be. By the time this happens. it would be impossible not to imagine a cordless Virtual Reality.